If you’re looking for professional home cinema installation in Essex, Rococo Systems is the answer. We’ve got the necessary knowledge and skills to find exactly the right equipment for your needs and install it in your home with minimal fuss and mess. 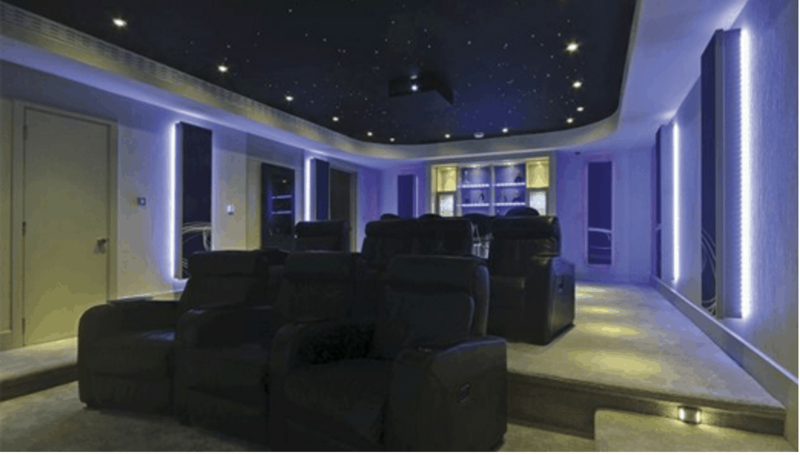 Rococo Systems are the experts when it comes to home cinema installation in Essex. Therefore, we’re very familiar with sad tales of customers learning the hard way that not every system is the same, and not every company offering home cinema installation in Essex has the superior expertise or specialist installers that we do. With over twenty years’ experience in this field, we’ve got the upper hand on our competitors, some of whom will try and sell you inferior, unsuitable or overpriced systems. Nor will we tell you that there’s only one way to get the job done. Our expertise lies in working with you to develop cost-effective solutions for dedicated home cinema rooms, lounges, and even outdoor setups. Our comprehensive service also guarantees we’ll be with you from the first step of your home cinema installation project to the final one. Should your house or apartment require any building work or interior redesign before you can take receipt of your bespoke system, our technicians here at Rococo Systems will be more than happy to work alongside them. We can also demonstrate both current and upcoming technologies, show you a wide range of technical kit in our Essex showroom, including screens, speakers, and projectors, as well as key home cinema installation accessories, ceiling and wall mounts, and lift mechanisms. Call our Home Cinema Installation Team in Essex Today! If you’ve got your dream house or flat, there are many things you can do to transform it from welcoming to positively luxurious. Some people choose to fit wet rooms, hot tubs, or games rooms (a.k.a. ‘Man Caves’) where you can play pool and console games; others want all these and more. A home cinema isn’t just about having the biggest TV/projector or the loudest speakers on the market. It’s about finding the perfect companion for your home, which can easily be upgraded or altered years later, saving you the cost and hassle of replacing your entire system. With Rococo Systems, you’ll be able to enjoy stunning graphics and sound quality all from an optimum viewing position. It’s like having your very own VIP seats in a modern multiplex, or if you’re a live sports fan, the best seats in the entire stadium. All you need to do is buy in plenty of popcorn and snacks and leave the hard work to us. Visit our website or give us a call today on 01277 890 888 to find out more.